Simple Spaghetti Sauce Recipe - San Diego Dining Dish! 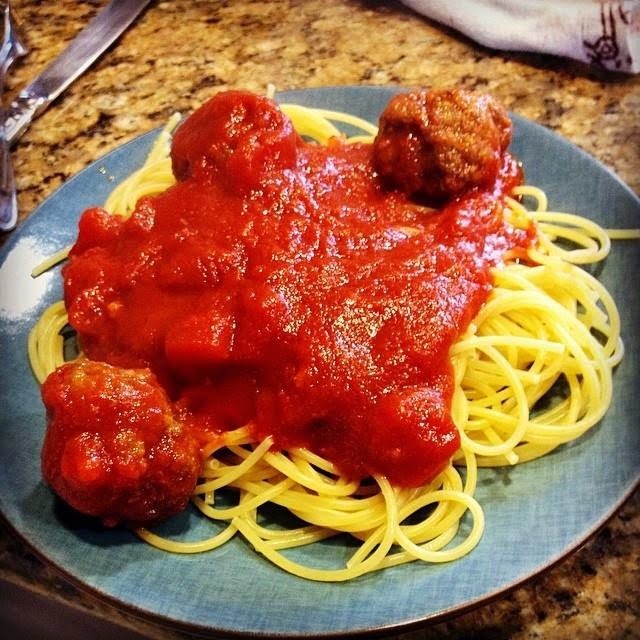 A couple of weeks ago, I shared my recipe for 4-Ingredient Meatballs. I had promised to also share my recipe for easy spaghetti sauce, and well, here it is! This recipe also has very few ingredients, so it is important to use the best that you can find for the best flavor. This recipe can be tailored to your tastes easily -- add some ground beef (cooked, obviously), vegetables, or play with the spices to make it your own. This recipe is more of a blueprint than anything. In a medium sauce pan, heat the oil and add the garlic. Allow to cook for a couple of minutes, being careful not to burn the garlic. Add the tomatoes and spices, and bring to a bubble. Turn down the heat and allow to simmer for 20 minutes. If desired, throw in the meatballs and allow them to simmer for an additional 15 minutes to absorb the flavor of the sauce. Serve over pasta or polenta (I use Giada's recipe, using stock in place of the water, and it is amazing!). With the meatballs, this sauce makes for an extraordinary meatball sub. Simply heat with the meatballs, ladle onto a store-bought torpedo roll, and sprinkle with mozzarella over the sandwich. Another great addition is to saute chopped mushrooms with the garlic for a lovely flavor.